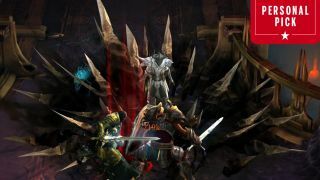 A bit of Diablo 2 revitalised the 2012 action RPG. This is the year that the Necromancer returned to Diablo to show the other classes how it's done. Fashionably dressed in the bones of his enemies, the Necromancer sneers his way through Diablo 3's acts with style, killing hordes with bone spikes and blowing up their corpses for massive damage. Levelling the Necromancer is great because he can churn through mobs with appalling speed at normal difficulty levels, which means you get new skills to play with every 10 or 20 minutes. Those skills take you on a journey—a murderous, horrifying journey—through the inside of the Necromancer's twisted imagination. Corpse explosion is just the start. Later on you can turn corpses into fleshy spiders that rush towards enemies and then explode. You start out with a troupe of skeletons, later you're commanding a flesh golem to flop onto enemies and explode into wet, bony chunks. There are ways to get more technical with the Necromancer, if you're happy to dabble with overlapping auras and curses. Towards the end of the skill unlocks you start learning how to sacrifice your own life essence to deal more damage—a risky way to squeeze out tens of thousands of points of extra damage at higher levels. Thanks to these skills there was enough variety to keep me testing builds and pushing up through the difficulty levels for 12 hours or so. It's fully voiced, there's tons of new armour and items, including some neat sets. It's everything I would want out of a hero expansion for Diablo 3, and I'm pleased that the Necro featured a mix of new and old powers. Part of me misses Poison Nova, but I'd rather be coming up with new builds, and I need more than the free Diablo 3 seasons to bring me back to the game. Just booting up the game earlier to grab some screenshots, I came up with an idea for a build that could keep a singularity Skeletal Mage in the battle at all time. This expensive summon drains all of your power but does huge damage throwing ghostly fire at enemies, if you can keep your powers regenerating with leech effects then voila, infinite ghost fire turret pet. Rise of the Necromancer made me realise that I'm not really hurting for new zones in Diablo 3. With the release of Act V I feel like I've seen everything Blizzard can do in that framework, with that engine. It's easy to forget that the game came out way back in 2012. The things I want from Diablo—bigger hordes, better co-op, flashier graphics, more detailed heroes and gear—probably aren't going to happen without a move up to a new game, but it's still a slick, moreish action RPG that I'm happy to sink a dozen or so hours into for an expansion.